Industrial Black Pipe Drink Rail With Shelf Support Brackets "DIY" hardware parts kit **Wood top is not included with purchase. Hundreds of satisfied customers have purchased and assembled this item. Simple and easy Do It Yourself project. Money back guarantee if you're not completely satisfied! 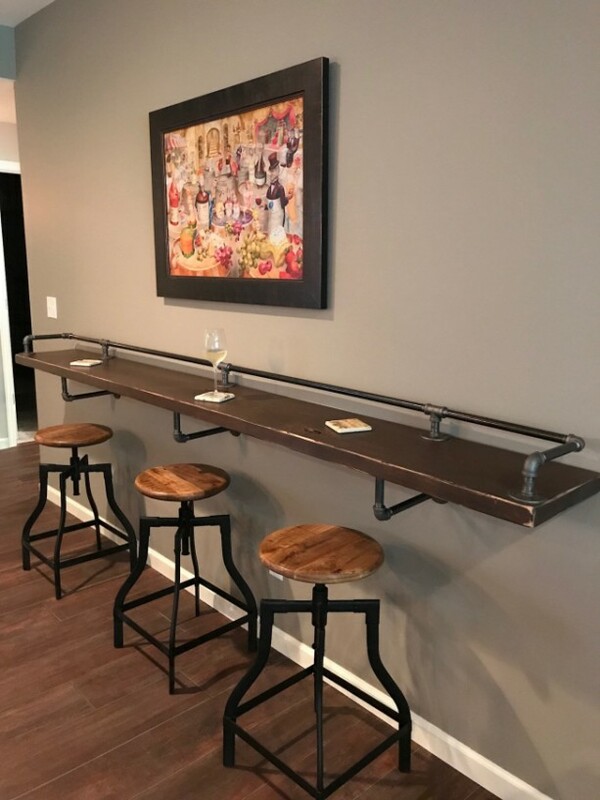 Industrial Black Pipe Drink/Bar Rail, Mini Bar Space Saver With 3 Shelf Support Brackets "DIY" Parts Kit, 8' Long x 12" Deep Parts kit includes all 1/2" pipes and fittings for the top rail and support brackets under the top. Rail is measured from end to end of the round flanges. The top depth & shelf support brackets options are 4", 6", 8", 10", 12", 14", 16" 18", 20" 22", and 24" deep to the outside edge of the round flanges from the wall (I can customize this size for you if you need a longer or shorter bracket). Drink rail is 3.5" tall Support brackets underneath (5" tall) Wood top and mounting screws not included. Chairs not included only the pipe hardware. Easy to assemble parts kit. Very detailed and easy to follow instructions will be emailed to you once you place your order. I am available for questions concerning the assembly as well. You can screw the pipes and fittings together by hand tightening each piece. Assembly and cleaning of pipes required. Please reference the Q & A section in my Etsy shop for instructions on cleaning and more details regarding the black pipe products sold in my store.